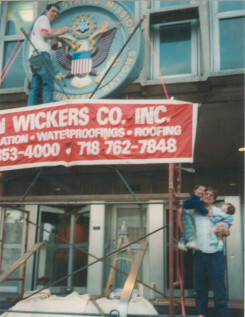 United States Mission to the United Nations - Jon Wickers Construction Co. Inc.
1989 Client: The United States Federal Government GSA- Under the first Bush Administration, our company was awarded several emergency projects. Above pictured is Jon Wickers Sr. holding Jon Wickers Jr. (now V.P. ) in his Right arm and son, Alex Wickers in the left arm. This emergency project entailed stripping and art detailing the U.S. Seal at the Door of the United States Mission to United Nations. The Seal had become severely damaged by a broken condensation pipe just a week before President Bush was scheduled to appear at the Mission. We were able to restore it in time for his visit, also changing the Former Color Schemes to properly reflect the Historical Records. The artist pictured on the Wickers Staging is Eric Hill.